As a matter of fact, we have been making hay while the sun shines. No hay fever but lots of fun! Ruby is very impressed that you are driving that big huge tractor! Nice work! We love to impress the women with our mad farming skills! Hay! 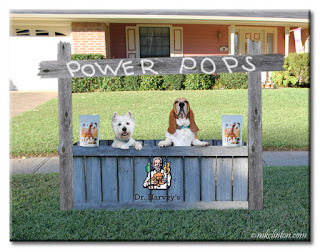 Did you know there is a new AKC Title called Farm Dog? Maybe you boys should give it a try? Does it involve driving a tractor because we would totally rock it! Hey there! We are hitting the hay! BOL! All of our farmers roll these big circular bales. Look at you concerned about too much sunshine on your head, Bentley. You boys didn't forget the sunscreen, right! One can never be too cautious when riding the tractor! There is a lot of fun happening on the Bayou! I love these pictures... too funny! I can imagine that it is beautiful up there! I hope you are able to get up and around soon. A farmer's job is never done! You know all the right words to say and that is why we love you sooooo much!! We are a special type of farm dogs. Rollin' in style! They love rolling the grass. Does that count?? BOL! You boys have your own tractor??? Jealous!! 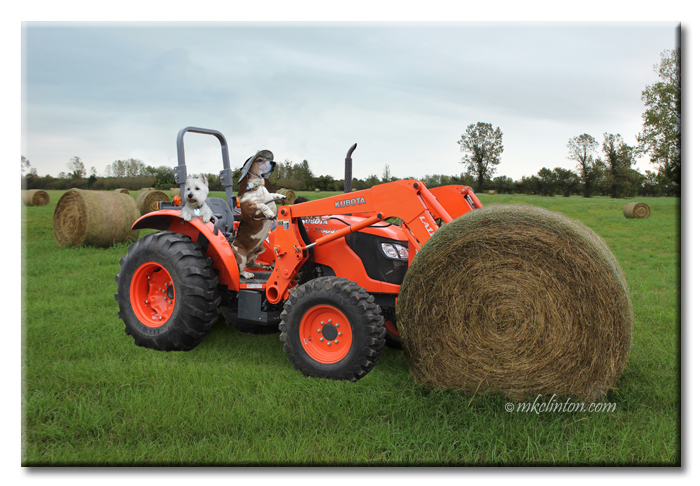 We love us a Kubota! The orange is perfect for Halloween so we hope to take it trick or treating. BOL! Not sure if that is a hay baling machine, but it's a cute picture anyway! We can make hay with any piece of farm equipment. It is a farmer's job. LOL! That sure looks like fun! Thanks! We had a blast. You boys do great work!! Thank you! We enjoy the farm life every once in a while. They are wacky but lots of fun! What hard workers you are! A farmer's work is never done! Where were you guys when I had horses and had to make hay??? OMD! We could have baled your hay and ridden horses. Girls love a dog on a horse, of course! pees: can I drive the tractor next??! You can always hitch a ride on our tractor, Ruby! Pierre and Bentley, you guys have skills! Good job on making that hay! Thanks so much. We are dogs of many talents.